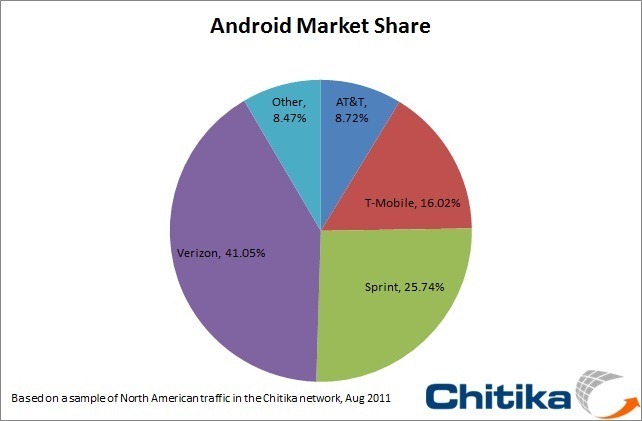 It seems likely that low-end Android devices are having a big effect on these numbers. 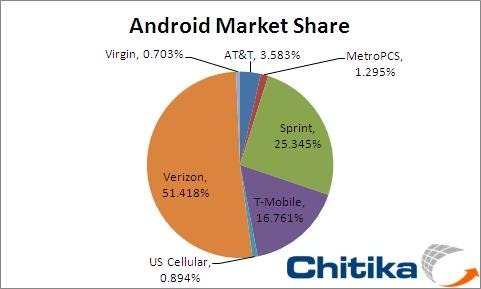 As Chitika's statistics are purely derived from web traffic rather than retail sales or subscriber data, this means all pre-paid Android phones are included as well, like the Huawei Ideos and LG Optimus V, both of which have extremely low entry fees and run on very low-cost data plans. And with higher-end phones like the Motorola Triumph on Virgin Mobile, the budget carriers are starting to get a lot more interesting all-around. Of course, AT&T has also seen a boost in its Android device portfolio since March, with phones like the HTC Inspire, Motorola ATRIX, and Samsung Infuse adding high-end flair to what was previously a very lackluster lineup. These devices have given AT&T more appeal to Android users in what was once a decidedly fruity smartphone selection. Verizon, on the other hand, has lost a fair bit of ground. However, it would be wise to hold judgment on that, as the sheer growth of Android in the last five months doesn't necessarily mean Big Red is losing its Android devotees, so much as the competition is growing faster. Verizon doesn't exactly have budget smartphone options, either, with its cheapest pre-paid smartphone plan starting at $44.99 with no data or text messaging included. 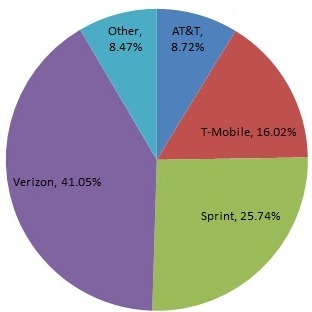 Edit: The iPhone 4 on Verizon has also, obviously, had considerable effect on these numbers - along with the aforementioned Android growth on AT&T and the budget subscribers, Verizon's comparative growth in the Android market has been considerably stifled. As the number of Android phones on the market only continues to rise, it seems some carriers are benefitting more than others.